I have recently decided to incorporate more honey into my cooking and baking, rather than sugar. Honey is definitely better for you and is certainly more natural. I was also intrigued with what was going on with the origins of our honey and more importantly, what’s up with the honey bees? 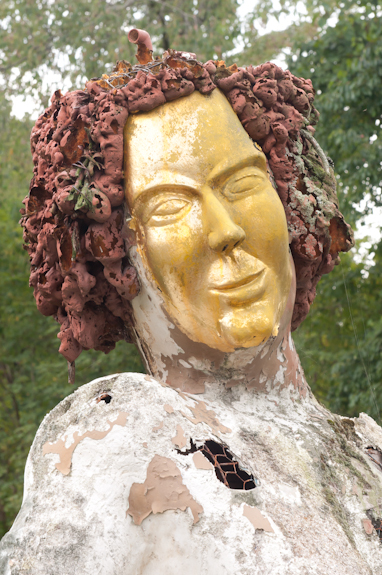 So, being the curious now 50 year-old gal that I am, Bunkycooks went On The Road to visit the Green Goddess Farm in West Asheville, North Carolina to see what all the buzz is about! Don’t give me a hard time about saying that, you know I just had to do it! 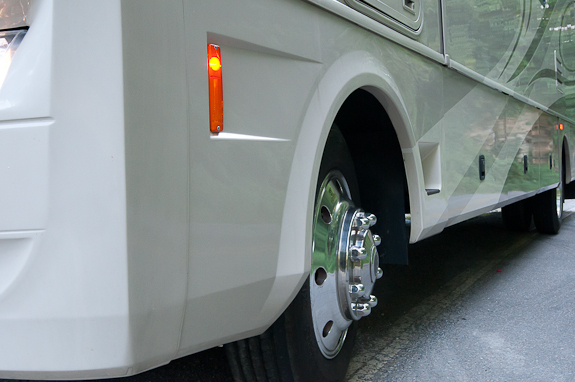 We’re on the road again…can’t wait to get on the road again! Carl and Joan Chesick own this thirteen acre organic farm that is home to many types of produce, but they are probably best known for their bees and their honey. They have been farming since the 1980s, but moved to this property in 1994 and the place has been buzzing for the past eight years (with bees, that is). I never realized there was so much to learn about bees and honey. Did you know that much of the honey in the U.S. comes from other countries, including China? 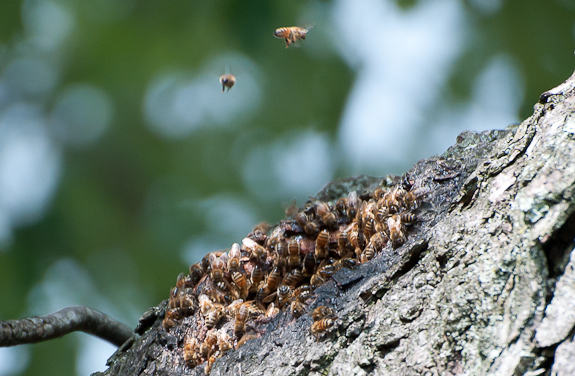 Did you know that 20-40% of all honey bees have died in the past 5 years? That certainly got my attention. There has been a fair amount of press over the last few years about beekeepers losing their bees. The loses have been attributed to many factors, some of which are mites, pesticides and viruses. Carl Chesick with his hives. 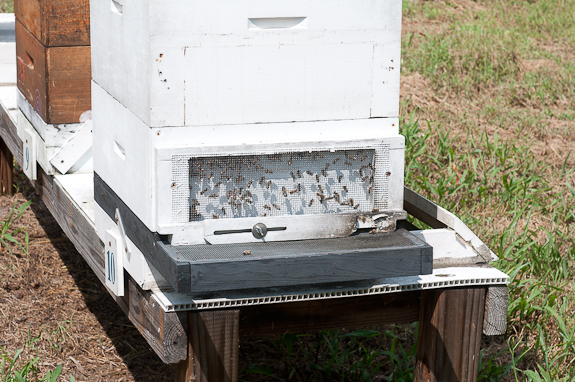 Many beekeepers have opted to use substances like formic acid or thymol to treat their hives. 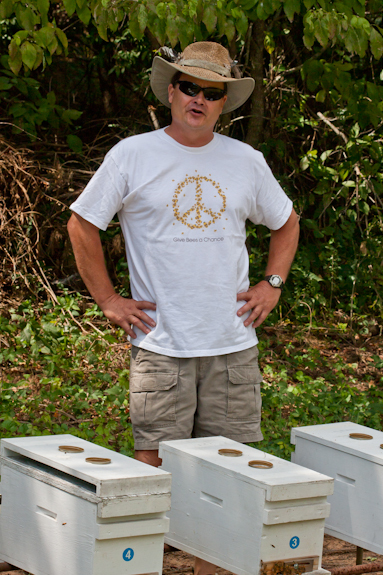 However, Chesick, who is the director of the Buncombe County Beekeepers Chapter, is one of the few beekeepers in the Asheville area that has decided to raise his bees naturally. Stay out of the flight paths! Many beekeepers would say that is risky. For Chesick, it’s a matter of quality and sticking to a different approach that he felt would pay off. This is a wild beehive. Two bees are better than one! 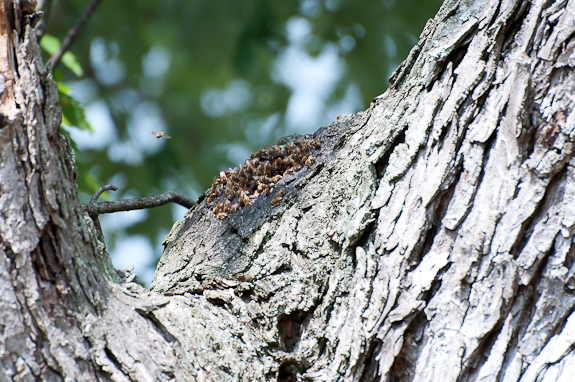 These wild bees have been in this tree for four years! The goal is to ultimately have bees that are more resistant to disease (relate this basically to people that take too many antibiotics. Eventually, we become resistant to them). Carl said that at first people just thought he was lucky when he didn’t lose his bees, but after proving that they are more resistant when not treated, now he is no longer lucky. They believe that he is right. You can read more here. Of course you did! You are such a wonderful blogger because not only do you highlight great ingredients…but you take us directly to the source. I just love it! I also have been using honey more and more in recent months. It was so intriguing to see an actual honeybee farm, and to hear about Carl’s philosophy on keeping his bees healthy and strong. And then the cornbread looks delicious. No surprise there! Oh WOW! Amazing. I love this post. wow this is amazing, did you use a macro lens on the bee’s what a shot…lovely post! I really love this post. What a great visit to NC and some great info about raising bees! Thanks! Thanks for sharing! I’ll have to get out to Asheville now. It’s so disturbing how easily we can be lied to about our food – corn syrup disguised as honey. Thanks for the alert. Again, Gwen is amazingly prescient when it comes to news. The information about the latest academic/military research about the loss of bees is fresh off the web. Aside from that, this is a honey of a story (all right, all right!). Leave it to Mr. Bunkycooks to comb through (yeah, I tried it again….) sources and find a sweet one! Great story, Gwen! As you know, I represent a honey company (Honey Ridge Farms) and they, too, maintain strict standards in caretaking of their bees. It comes from 5 generations of beekeeping experience and devotion. One thing folks can do when purchasing honey is checking the label to see that the honey is USA locally sourced. Many small producers are including that to separate themselves from the imports. Another bonus, those same small producers have the quality control tools in place to trace their honey back to its original source. A very important factor these days. Another neat fact re. healthy/honey: buying local honey can also help to build immunity to pollen allergies, since the bees, too, eat local! It’s like taking tiny allergy shots and helps to lessen pollen sensitivity. However, those with severe allergic reactions (asthma) should proceed cautiously. Can’t wait to try that beautiful cornbread – grazie for the recipe and the wonderful story. I wish the Chesicks all the best and thank them for their incredible work. I love honeybees! Someday I would love to have my own but for now I buy local honey. And now I know what I will do with it next! Delish! Your cornbread is amazing. I love the sage leaf in there very, very much. I did know about the bees dying off. I’ve heard that part of it is because of a decrease in the amount of pink clover and that one thing we can do to help the wild bee population is to scatter pink clover on open fields. Another fabulous road post Gwen, thanks for sharing tons of interesting information. I had not heard of this great bee loss but felt the price increase ouch! Lets not forget about honey and biscuits, something I never heard of until I moved down here! Hope that answers the mystery! Wow… Gwen that’s a great post. So informative, and how fun is that to be on the road going to all those great farms. Lucky you. The skillet bread looks delicious I love cast iron skillets they are so versatile. So glad I landed on your site. I’m planning a cornbread and honey extravaganza at my house later this week. Something so comforting about this snack. Thanks for all the info too. It’s really evident that you care about your food and the facts behind it. You’re an inspiration! Thank you so much for all the information on honey and bees – I didn’t know the half of it! Btw, your photography is always good but in this post, it’s just breathtaking! 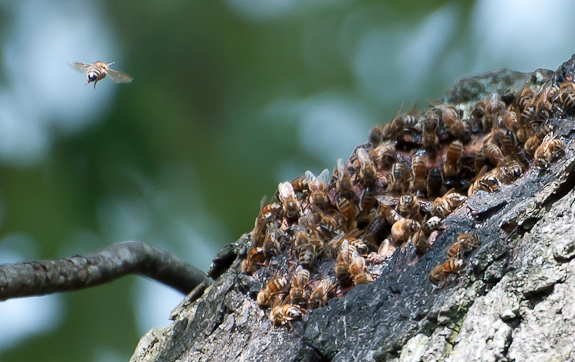 I love the bees in midflight shots…. It’s so sad to hear about the plight of honeybees, and is such a serious issue. I didn’t realise there was a problem with ‘counterfeit’ honey, but I guess it’s not such a surprise. You’ve also reminded me that I have some loofah seeds lying around somewhere that I forgot to plant! I luv honey. When I was growing up, my Dad forbade commercial syrups in our home for pancakes, waffles, etc. We had to use honey. Bees are so important, I hope scientist really are making strides in saving them. Fantastic post, Gwen. 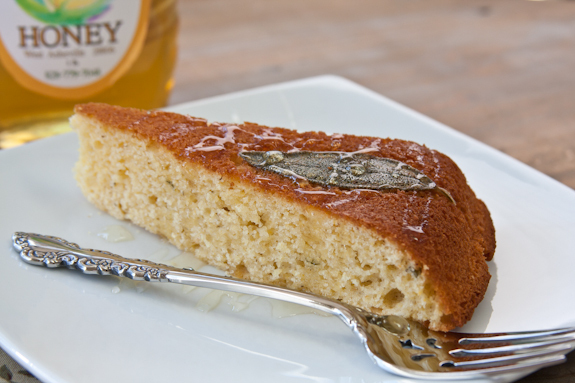 This honey and sage skillet cornbread looks amazing…I need a skillet like that! That’s a mean lookin’ RV you got there. Winnebago? It looks very similar to ours. Can’t wait to see where you travel next! We recently stopped in a specialty store selling various types of “local” honey. When we looked carefully at the label we realized that it was packaged locally and the honey came from places like Honduras and other overseas locations. You really have to be careful when selecting honey. Local honey has real health benefits (alleviates allergies and supports our local farmers). The next time you go shopping for honey, be on the lookout for honey that is truly locally produced. It may cost a little more but it is well worth it. Mmm, this looks delicious 🙂 I love a simple recipe that tastes delicious! Great photos too!!! Learn a lot about bees and honey today. Your corn bread looks delish and I like the sage in it. I am sure it taste good. I yet to own one cast iron skillet.